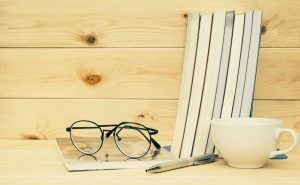 Looking for the best prescription glasses online? Then you are on the right page! There are hundreds of authentic brand name styles to choose from online. And they cost a fraction of the prices as if you were to buy them in stores. You can get them at retail value and have access to a wide range of frames. This is what makes shopping online easier. Shop at your own pace without the hassle of being bothered by a knowing sales clerk. You can easily find more information about any product just by clicking on the picture. In fact, you will find the frame material, shape type, and such things as the bridge and temple length. When choosing your perfect frame, the measurements of the frame indicate how your frames will fit you. If you want one that will fit you, look at a current pair of glasses you own. On the inside of the temple, there will be numbers. If you like the way they fit, find a frame with those similar measurements to ensure the best fit. Also, in ordering prescription glasses, make sure your prescription is not older than one year. The P.D. (pupillary distance) is also important in ensuring the perfect fit. If you have any questions throughout the process, don’t worry. Contact customer service is easier than ever. By dialing by phone or sending an email with your inquiries, the online retailer will quickly come to your aid. Also, most online retailers have a money back guarantee to cover you if you are not happy with your purchase. Some will even concede if you would like to exchange for another item. Just contact the customer service team. They will take care of that right away. So you don’t have to walk in the cold or the hot temp all day to get your questions answered. The first thing you have to do is to have an up-to-date prescription. If you’re an adult, you should update your prescription in two years. If you are still growing or a younger man/woman, look at about one year. One year is better though, and make sure you have a good eye exam. Wherever you go check, make sure they are checking both eyes, dilating the eyes, and some other things. Before ordering online, you should have had an eye examination within the last two years. These are very important especially if you are buying for only one eye. It’ll also help to know them as that’ll help when you’re inserting them. Knowing them is the difference between making mistakes when ordering and having a successful order. Sphere: This is the amount of lens power that is prescribed to correct nearsightedness or farsightedness. Axis: This is the positioning of the cylindrical power on your lenses, which are important if you have astigmatism. They will help you select the right lenses for your glasses. This can make a lot of difference when wearing them – less discomfort. CYL: This is the amount of power in the lens for astigmatism that you want to order. This is in no way definitive. If you need more help or come across more term, you can ask your doctor. Or you can shoot us an email and we’ll assist you. 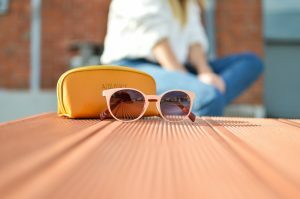 A good starting point is to consult a review site, such as [Eyewear Avenue], which provides valuable information about the online retailer’s reputation and quality of the eyewear provided. A good review site will also provide you with important information. Mostly the retailer’s pricing of products, special promotions, guarantees, and warranties. Also look out for shipping costs, delivery times and how satisfactory the customer support is. You can also ask specific questions about a particular brand. Things like the size of their inventory, quality of the customer service relation, etc. With this, you’ll know if the brand has quality products and has been able to maintain that since its existence. Having all these information shorten your research time and help you make an informed buying decision. 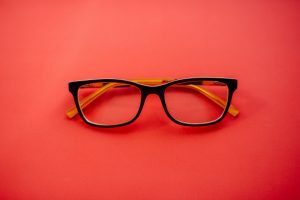 Picking the right pair of eyeglasses can greatly enhance your appearance by highlighting your best features while minimizing any imperfections. All of our recommended eyeglasses online stores provide intuitive and detailed search tools. They want to help you find the frames that suit you best and most flattering on your face. Search by shape, material, gender, rim style, color and much more. There is nothing more fun than picking out new glasses that fit your facial features. Whether you’re round-faced or oval-shaped, you can really find the best frames for your face. This is as wide as it is long, with a soft jawline and forehead. If you have round face shape, you want to choose square frames, just think round face, square frames. This kind of frame usually has a straight line across the top and sides, thus can sharpen up your features and add a little bit more shape and dimension while counteracting the natural softness of your features. You just want to make sure to avoid anything that’s too rounded especially oversized round glasses as this will just add to the roundness of your face and it won’t be as flattering as a square. If you have a soft jawline and forehead but your face is longer than it is wide, then you have an oblong or a long shaped face. Similar to a round shape face, you want to choose frames with a square or sharper edges. Try to go for a broader top line as this will add a horizontal line to broaden out the face and add some more balance. And as you have a long face and more space to play with, your frames can come a little bit lower onto the cheeks and this will once again add some balance to your face shape. Avoid small, narrow frames, particularly, round ones like this may not complement or flatter your face shape. If you have a square forehead and a square jawline and your face is as wide as it is long, then you have a square-shaped face. You should choose more rounded frames as this will add an elegant softness to your square-shaped face, similar to how a round shape face will go for a square to sharpen up the features. As someone with a square shaped face, you want to avoid frames that are overly square shaped frames as they just emphasize a square jaw and a square forehead, which isn’t too flattering. If you have elongated squares or a rectangular shaped face, go for oversized round glasses. You have a lot more room to play with similar to a long shape face. So, your glasses can sit a little lower onto the cheeks and a nice curved shape to the face. This will soften out any harsh features and give you elegant softer features and once again, avoid anything too similar to your face shape like small narrow rectangular frames. If you have heart-shaped or a triangular shaped face, you need to watch out for the top line of the frames to complement your rounded forehead on the heart-shaped face or a jawline of the triangular shaped face. This needs to be a little bit broader so make sure it’s slightly wider for heart-shaped faces or wider than your jawline for triangular shaped faces so this can add balance to your face. The great thing about being a rectangular or triangular face owner is that you can play around with your frames. Vintage frames, in particular, look great on your face shape. The only thing to avoid is oversized frames so go for dainty frames instead. What if you have an oval shaped face? Then you are lucky because you can choose whatever style you want. Everything works for you, so you can play around with as many different styles as you’d like. The only frames you want to avoid are oval-shaped otherwise, you can choose whatever you like and if you are still a little bit unsure about your glasses, go to [coastal.com], you can actually find a lot of styles that will match your face. Before you can choose the right frame that suits your face, you have to first determine the size that fits you. Fortunately, you don’t have to spend too much time on this. The first step is to ask your optometrist about the right size for your face but you can also take a few tips here too. Like ill-fitting clothes, eyeglasses that don’t fit can feel uncomfortable and awkward-looking. 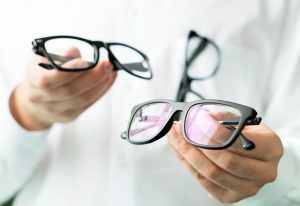 If you have a pair of old eyeglasses that are comfortable and fit well, you can use them as a guideline. The inside of the eyeglasses should have a pair of two-digit numbers like 55/21. The first number represents the width of the lens and the second number is the width of the bridge. Buying glasses is more than a prescription, it’s personal. And selecting the right frame can make all the difference. Even if you know what frame styles will suit you the best, the only way to know for sure is to try them on. Most of our recommended eyeglasses online stores provide virtual try-on widgets. This allows you to upload a photo of your face with which you can try on hundreds of frames styles virtually. Single-vision lenses are typically prescribed for people who are either near-sighted or far-sighted, but not both. Single-vision lenses only have one corrective power. Multifocal lenses are usually prescribed for people who have difficulty seeing things up close and far away. These lenses have two or more different corrective powers. Bifocals and trifocals have visible lines separating the various corrective powers. Progressive lenses do not have any visible lines. Plastic: The most common, basic lenses. Recommended for people with light prescriptions, ranging from no correction to +/-1.75. Most economical. High Index 1.67: The thinnest and lightest of all the materials. Recommended for people with high prescriptions. UV Coating: Highly recommended for all times of the year. According to the United States Vision Council, more than 40% of adults do not know that exposure to UV rays increases the likelihood of cataracts. Light colored eyes are more susceptible to UV rays. AR Coating: Why consider an anti-reflective (AR) coating? If you spend a lot of time on the computer, you should try one. Or if you are bothered by the glare from sunlight when driving, you may need glasses with AR coating. The AR coating will improve the clarity of your vision and help ease eye fatigue. The most important parts of your prescription your doctor might forget to include is the pupillary distance (PD). The PD is just what it sounds like: the distance (in mm) between the pupils of your eyes. When you are buying glasses online, it’s important to know your PD. Without it, it’s impossible to select the right-fitting frames. This measurement will let you know if your eyes will match the optical center of your lenses. For example, step-by-step instructions to measure your PD at home, please [visit this site for more information]. 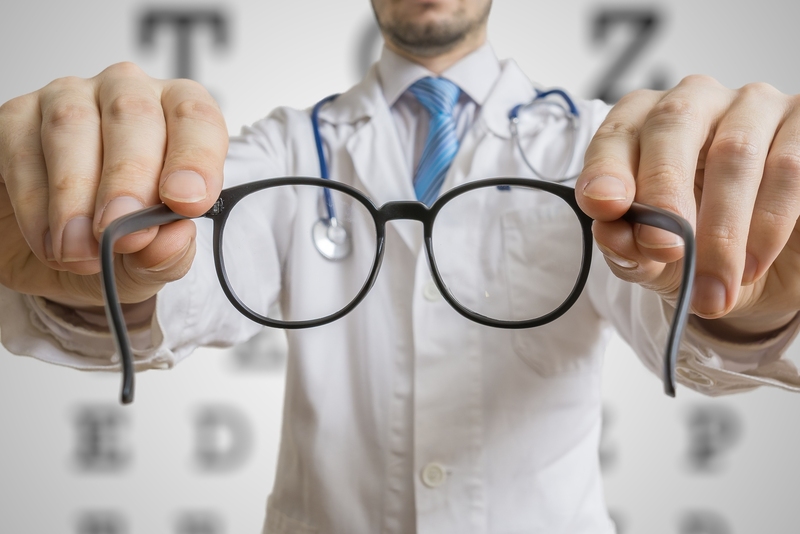 Purchasing your own prescription eyeglasses online is probably easier than you think. Make sure the information above is accurate. Now enter your information in the form provided to order your prescription and have them shipped to you.